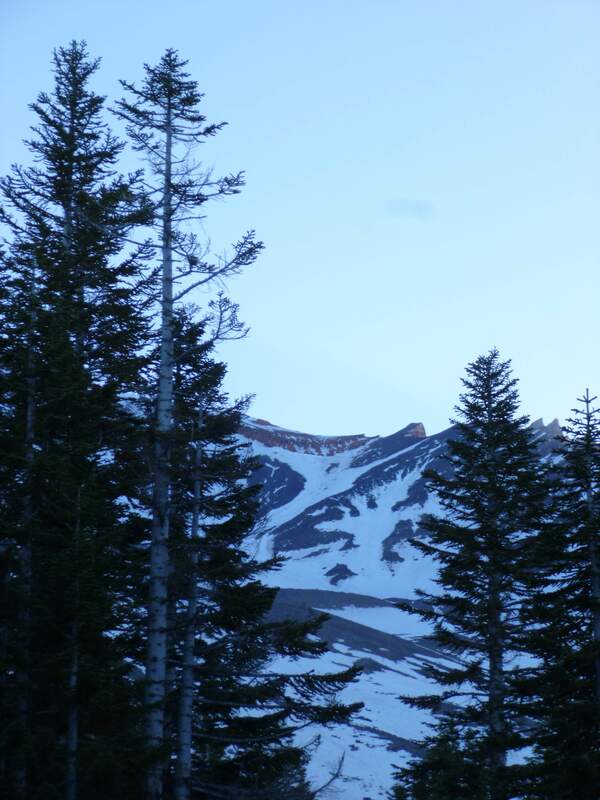 Mount Shasta from the south. Standing alone in northern California, 4322m Mount Shasta is the state’s fifth highest mountain and the second highest of the Cascade Range. 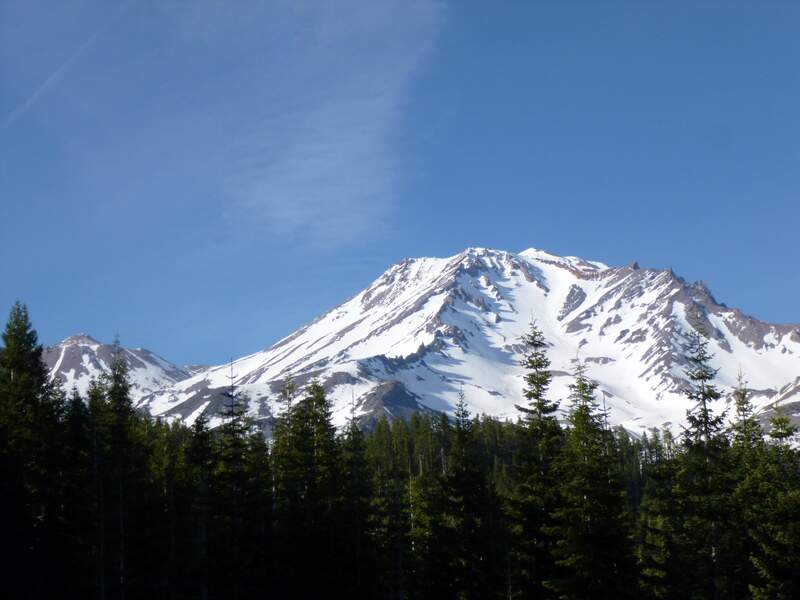 As Mount Shasta is isolated, it has considerable prominence over surrounding terrain. An active volcano, near the summit the smell of sulfur is noticeable, and areas with steam vents have historically been used for warmth and emergency shelter by early climbers. 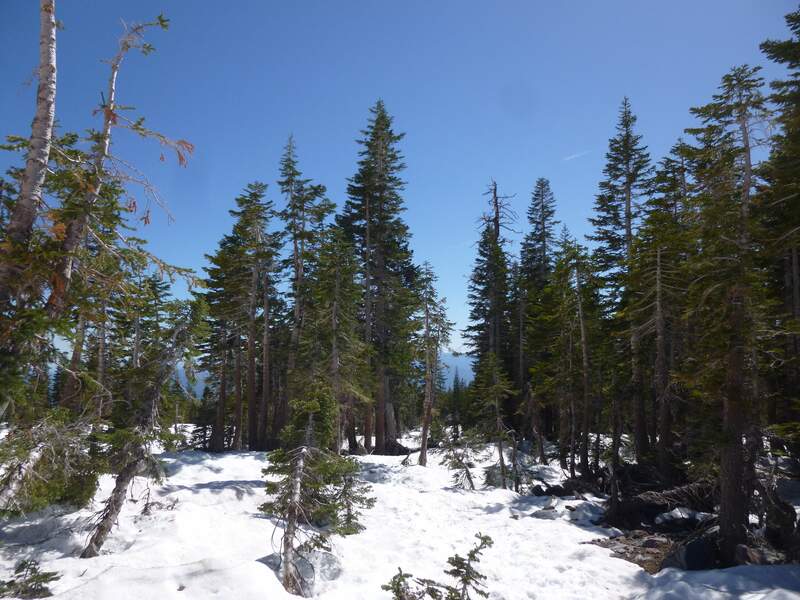 I climbed Mount Shasta by the standard Avalanche Gulch route, using a high camp at Helen Lake. 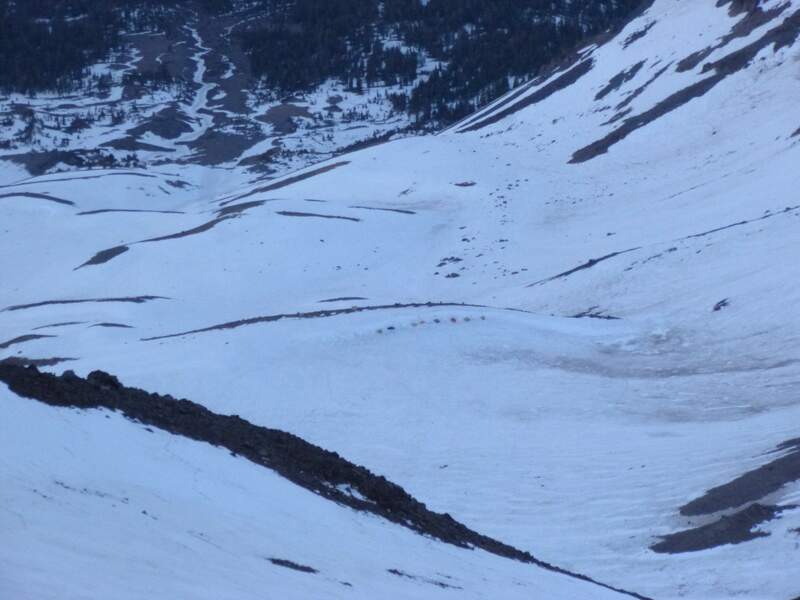 Avalanche Gulch, so named for the frequent winter avalanches which occur, covers 2200m of elevation gain over 17.7km. The below map outlines our route. 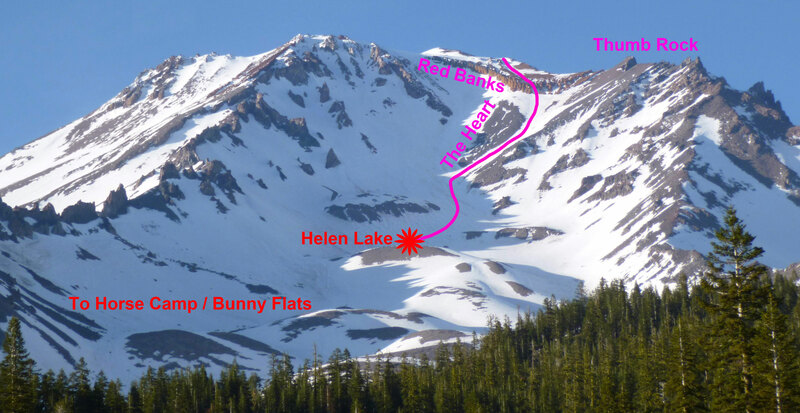 A map of our itinerary up Avalanche Gulch. Day 1: After getting out of the airport and meeting my climbing partners – my friend Don, whom I’d met in Taiwan, and one new friend, his colleague – we took a short trip to the local REI to pick up some last minute food supplies and a few bits of gear. 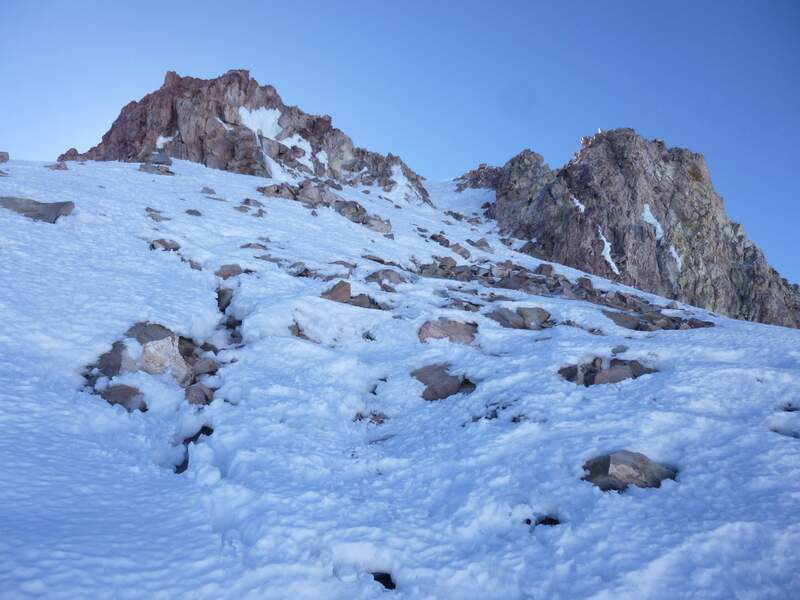 It was hard to believe we’d be sleeping on snow the next day, as Sacramento was seeing temperatures in the high 30s. 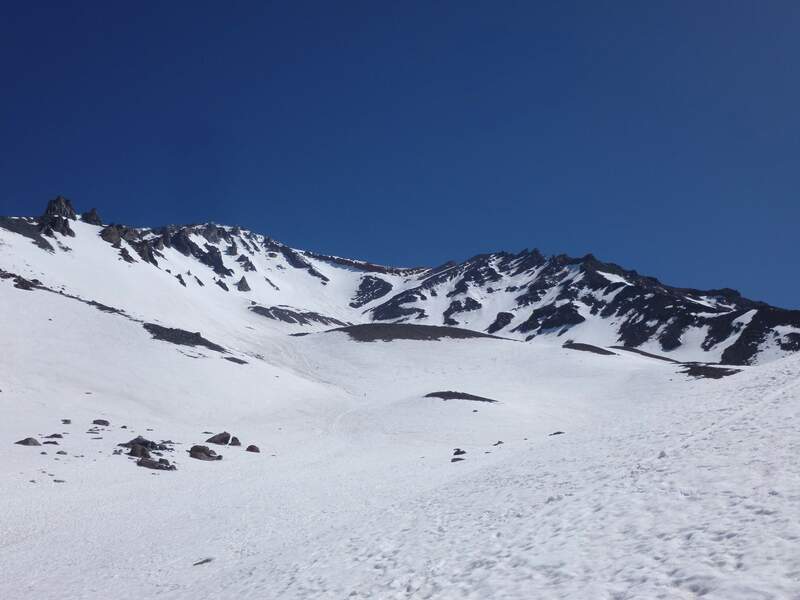 Yet snow was our destination, and I was very keen to attempt Mount Shasta after discussing trip ideas for months, deciding upon Shasta as an attainable goal, and finally having the opportunity to visit California and see the state’s famous mountains. From REI we had a long drive ahead of us. ~275km north from Sacramento along Interstate #5 took us into the aptly named City of Shasta Lake, near the base of the mountain and our trailhead at Bunny Flats. In Shasta Lake we visited a local outdoor equipment shop called The Fifth Season in order to check up on the weather and recent snow conditions, then grabbed some food and continued our drive up to the trailhead parking lot. At Bunny Flats, 2120m, we discovered the parking lot filled nearly to capacity. 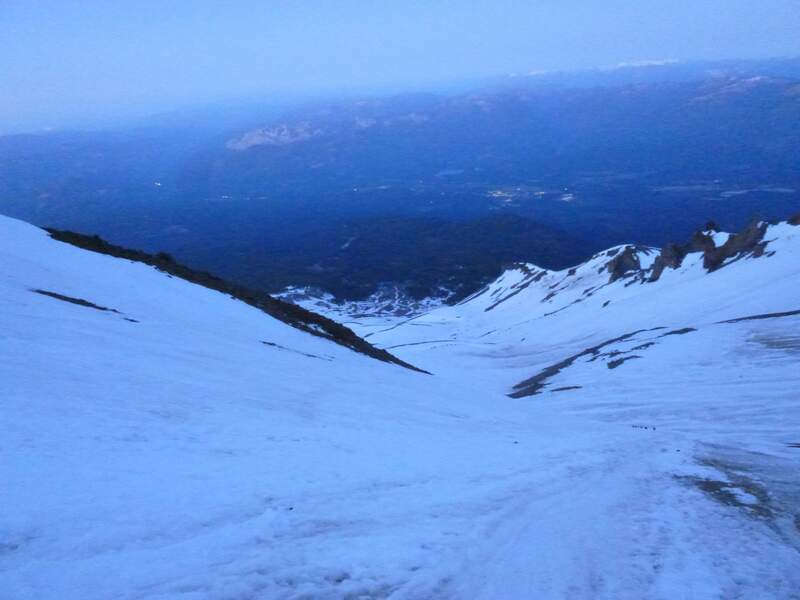 As we were arriving on a Saturday evening, a large number of climbers were already on the mountain. Our initial plan had been to spend the night camped in the parking lot, as a night here would serve as an excellent acclimatization interval for the next day. However, by the time we arrived we still had several hours of daylight remaining, and decided it would be much more comfortable to head a few kilometers up the trail and camp somewhere quiet. The trail begins ambling up through lovely forest over a wide, well-maintained path. 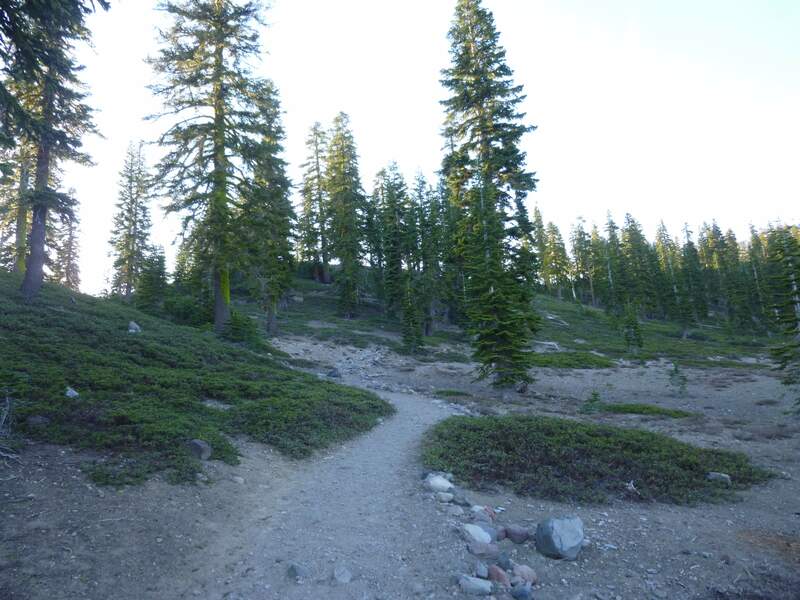 The beginning of the trail from Bunny Flats. About an hour in, at a relaxed pace, we decided to start looking for a suitable campsite. 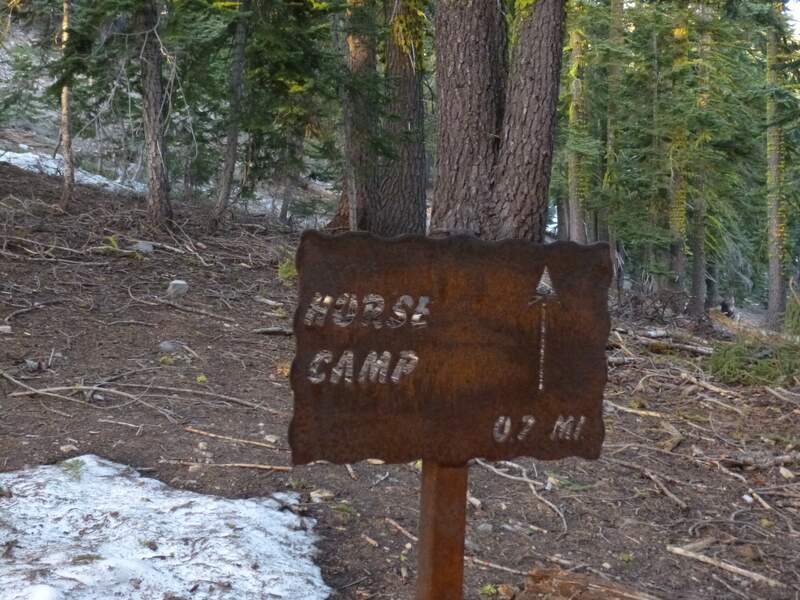 A nearby sign indicated we were 0.7 miles / 1.1 km from Horse Camp, commonly used as a starting camp and first overnight. 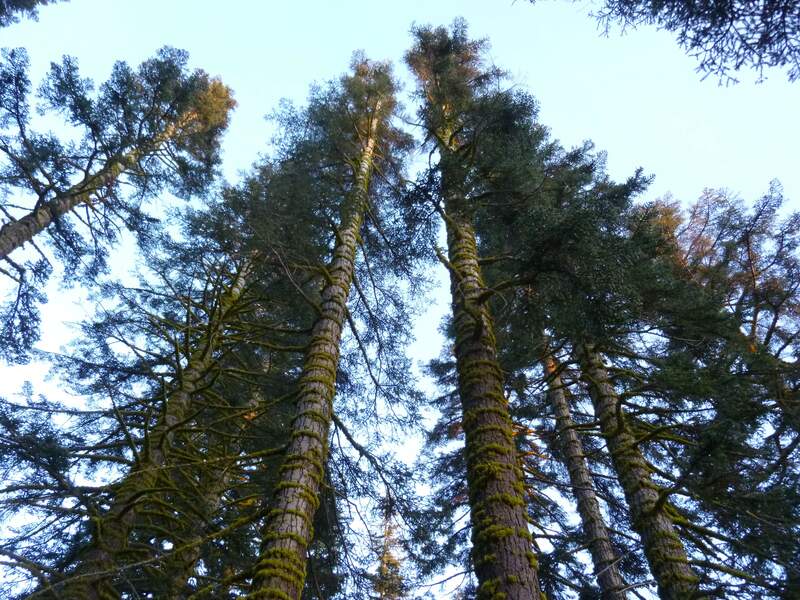 The forest here was beautiful, tall evergreens ringed with moss. Rings of bright moss covered the trees. We decided to use a flat, open clearing about 100m off the path. Day 2: Awake early, we packed up camp, cooked breakfast, and continued upwards. Through the trees we began to catch views of Shasta and the route we planned to ascend. Shasta from below Horse Camp. Thumb rock, a landmark of the Avalanche Gulch route, protrudes from the ridge. Ahead, Horse Camp came into view. 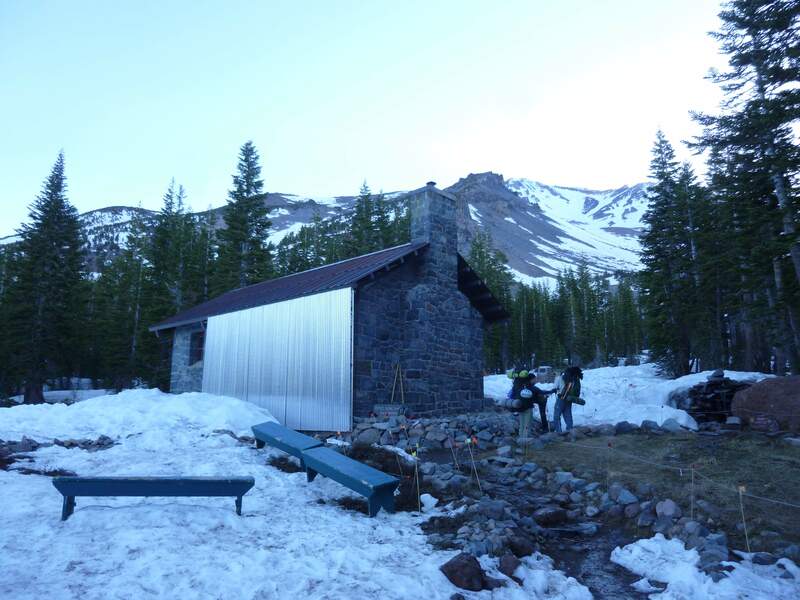 Situated 3.2km from the Bunny Flats trailhead at 2420m, Horse Camp serves as a base camp and emergency shelter for climbers approaching Shasta from the south. 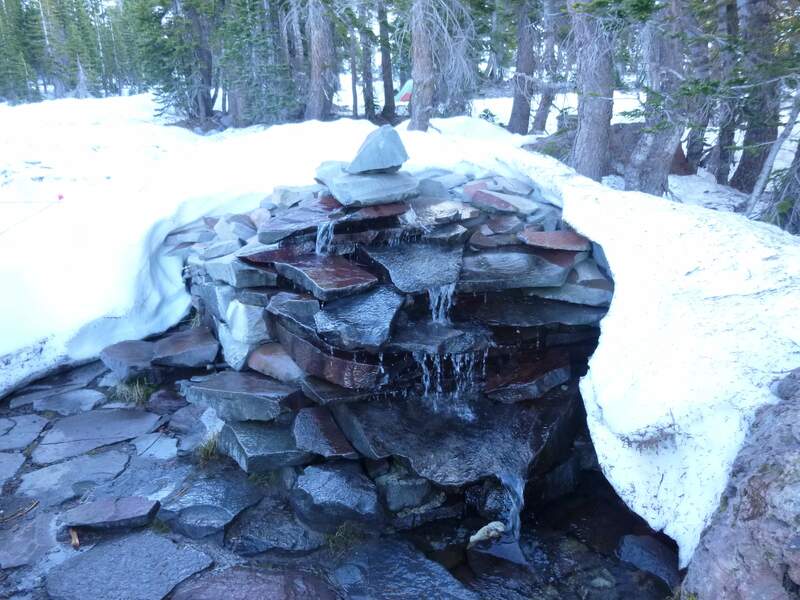 Horse Camp provides climbers with several resources including a sturdy ranger hut, an accessible runoff water source, several campsites, and most importantly a well-maintained solar toilet. The runoff stream close to the Horse Camp cabin. 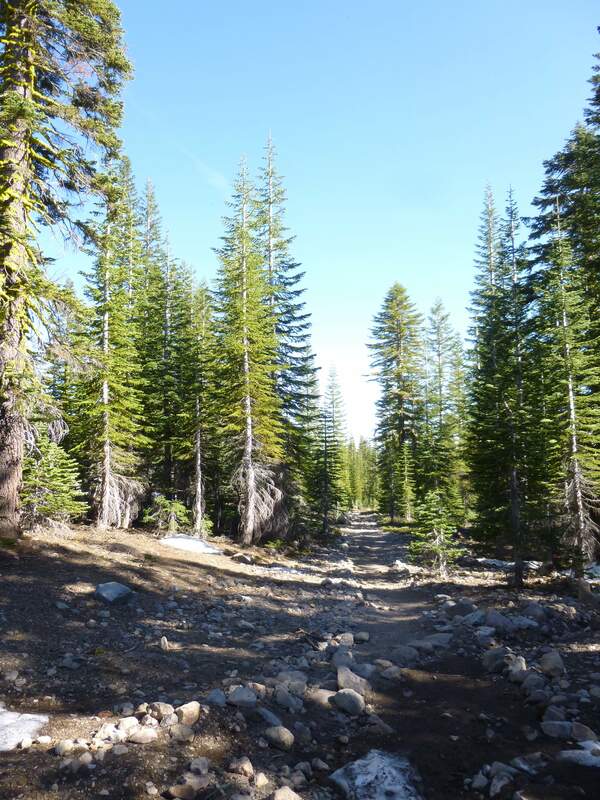 At Horse Camp we filled up on water and continued towards the base of Avalanche Gulch through increasingly sparse trees. Approaching Avalanche Gulch above Horse Camp. 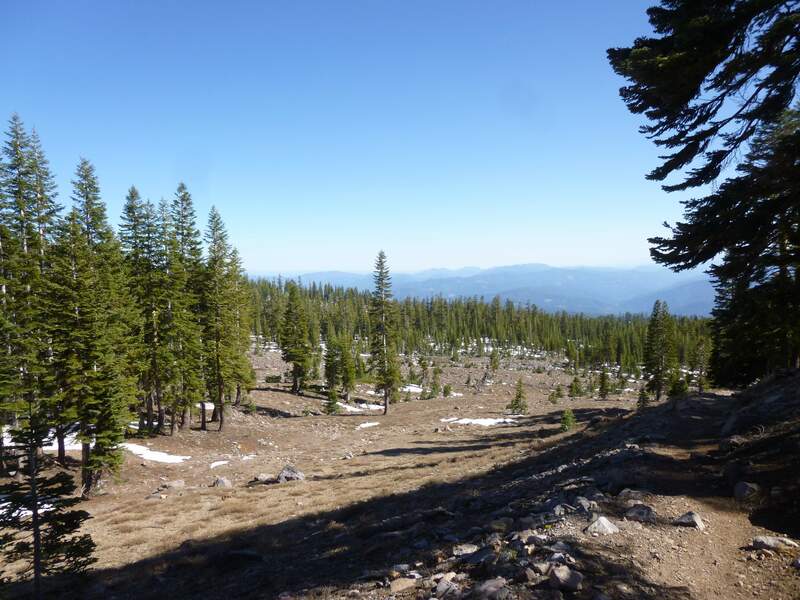 We had gained a bit of elevation above the treeline and enjoyed a nice view over the forest behind us. Looking back towards Horse Camp. It was unpleasantly hot here with the sun reflecting off of the snow, and no clouds or cover providing shade. Helen Lake isn’t visible during this section, which makes each little hill somewhat deceptive – we kept thinking that we’d spot it just over the next ridge, only to find yet another hill awaiting us! While our route of ascent could be seen, Helen Lake was still not visible. Still well below Helen Lake, we began to pass the first campsites. 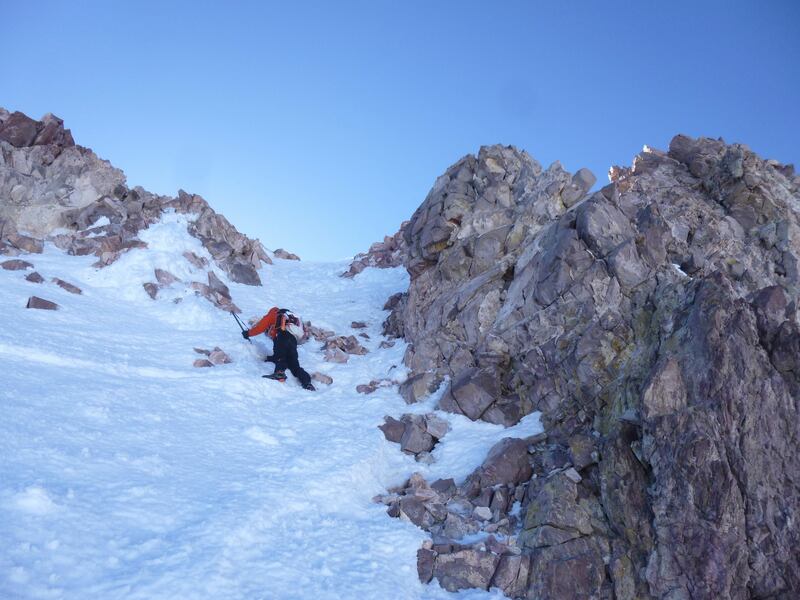 Many skiers and snowboarders climb Shasta, and prefer to camp low for an easier descent. Low campsites below Helen Lake. Finally we crested a hill and saw Helen Lake ahead of us. Helen Lake, the highest, wide hill in the middle of the picture. 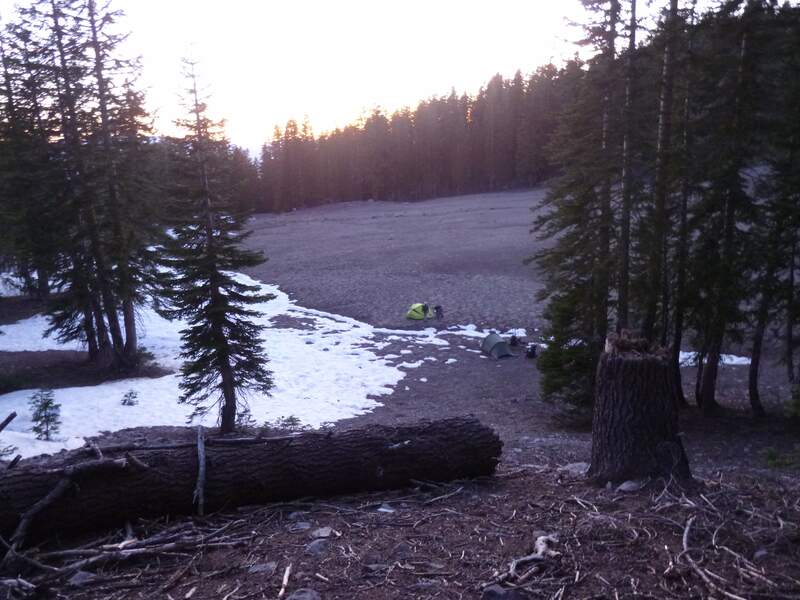 Helen Lake is frozen over and snow covered most of the year, and provides no water source (aside from snow!). 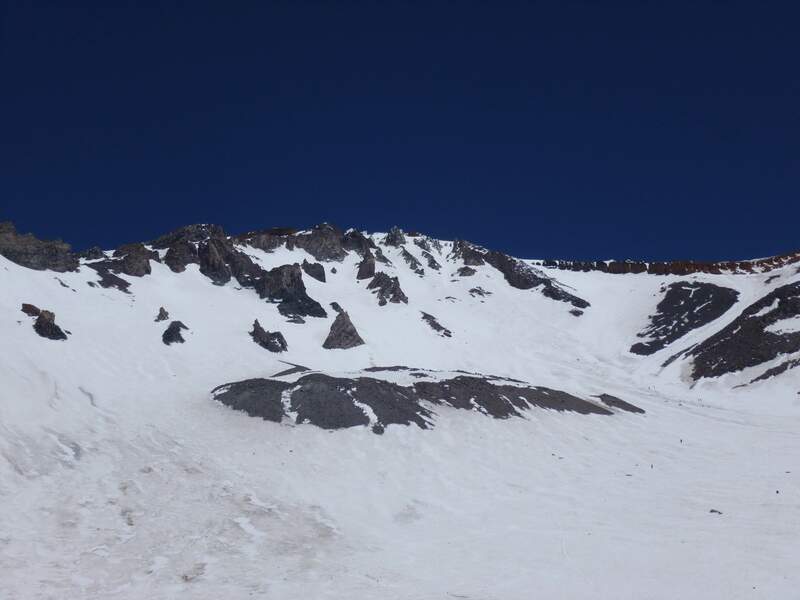 The area is mostly flat and a nice snow ridge serves as excellent wind protection. 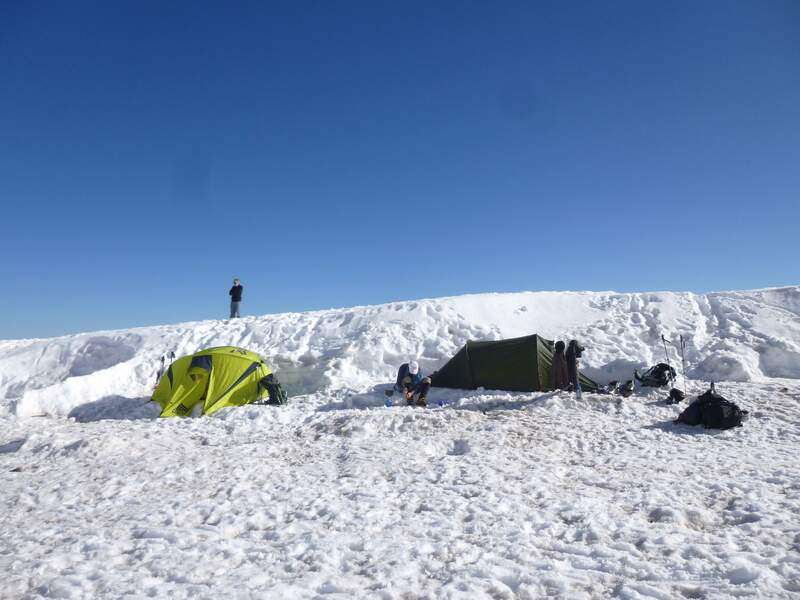 When we arrived there were at least two dozen tents, and a large number of climbers were visible descending the route. The crowd were headed off of the mountain however, leaving us our choice of camping spots. A crowded high camp at Helen Lake. Above us the route to the summit was clear, and appeared to be in decent condition. 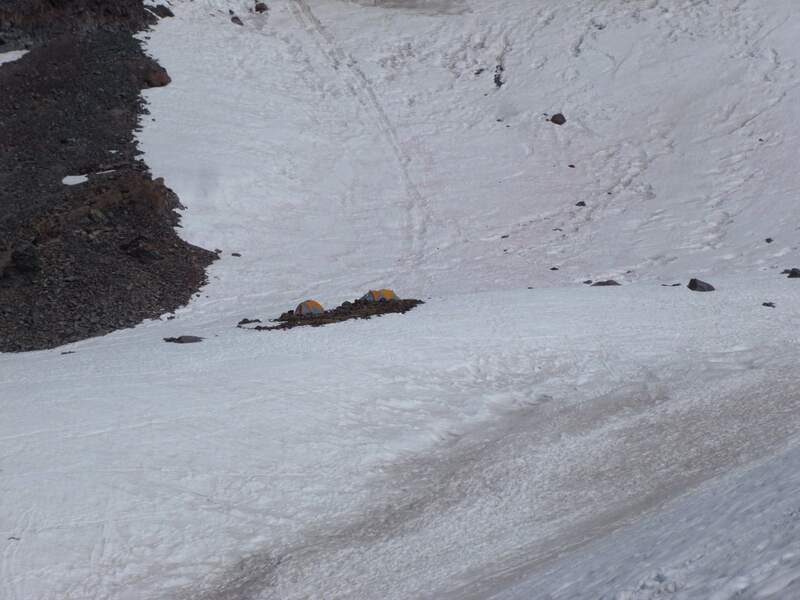 Others in camp told us that the snow was firm and reliable early in the day, if somewhat boot-tracked due to a lack of recent snowfall. 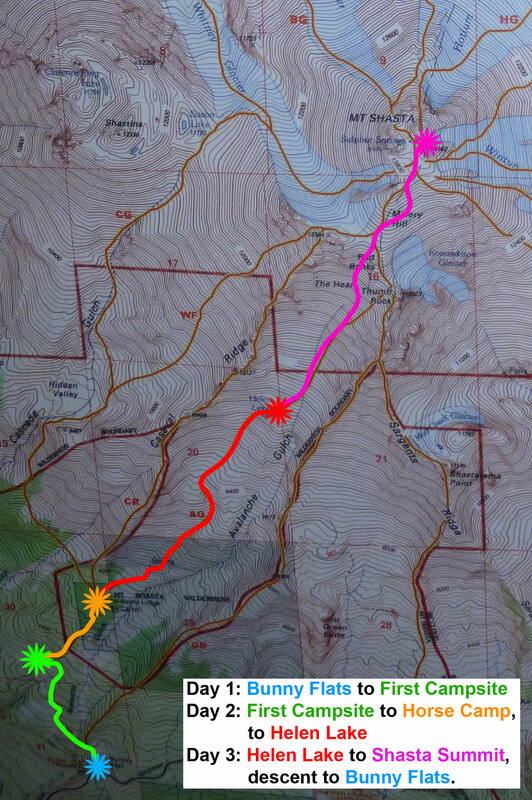 Our route to the top – Red Banks, The Heart, and Thumb Rock. 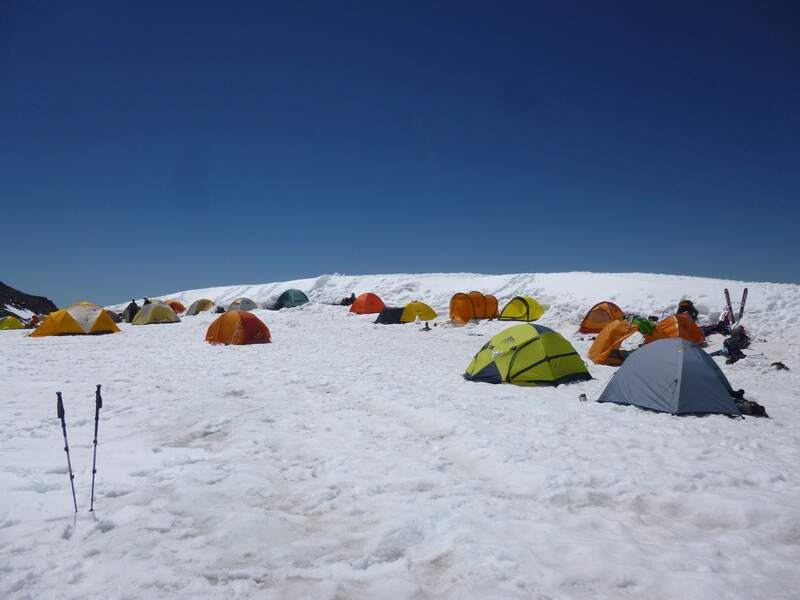 We pitched one of our tents and lounged with the doors open in the intense heat, waiting until other climbers finished packing up and began to descend. Once the others had departed we found a good spot for our tents and set up camp, carefully anchoring our tents in case of strong winds overnight. We were almost alone, with only a few other teams arriving later in the day. Our campsite at Helen Lake. Freeze dried dinner at Helen Lake. After getting our tents up we kept busy melting snow for water. We went to sleep early, planning for an early departure to ensure firm snow conditions. Day 3: Awake at 2:30 a.m., we made a fast breakfast and began heading up at 3:35 a.m. There was no wind, and the temperature felt like it was hovering around 0 Celsius. 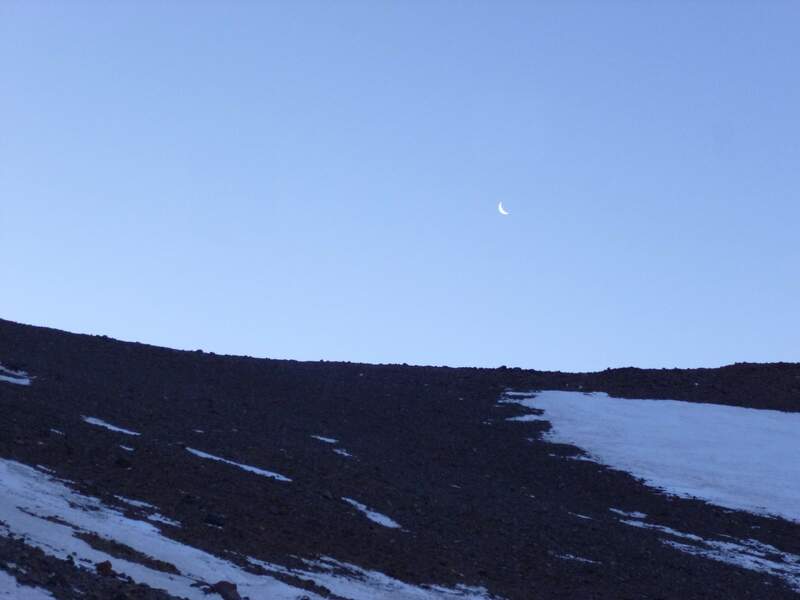 Shortly after leaving camp my new friend decided to turn around – he was experiencing bad stomach cramps and wisely decided that he shouldn’t continue upwards. Looking down at Helen Lake. The moon was still visible in the morning sky. Far below, we could make out our tents at Helen Lake. Helen Lake, our two tents to the far left of the row of tents. We made steady progress upwards, and were near the bottom of The Heart when the sun began to rise. 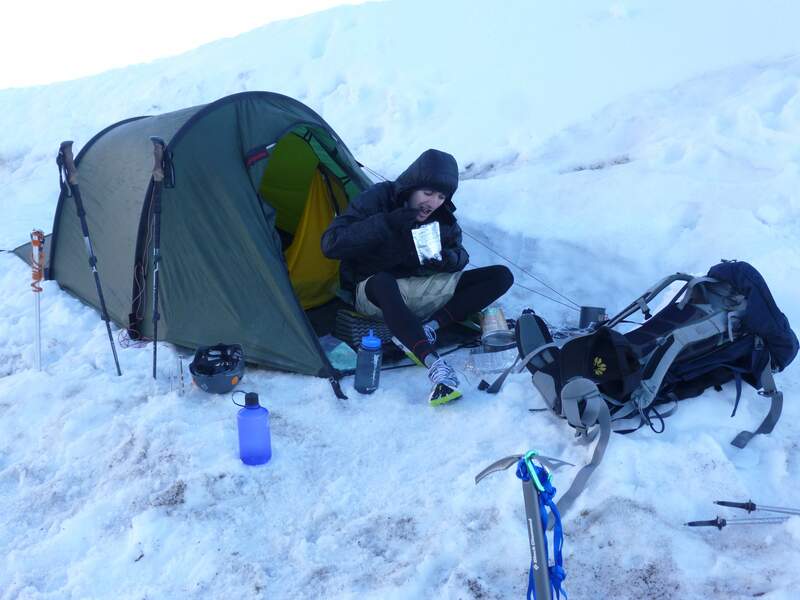 We struck up conversation with another climber whose partner had decided to turn around and descend to camp and continued on with him, making us a trio once again. Near the bottom of The Heart. 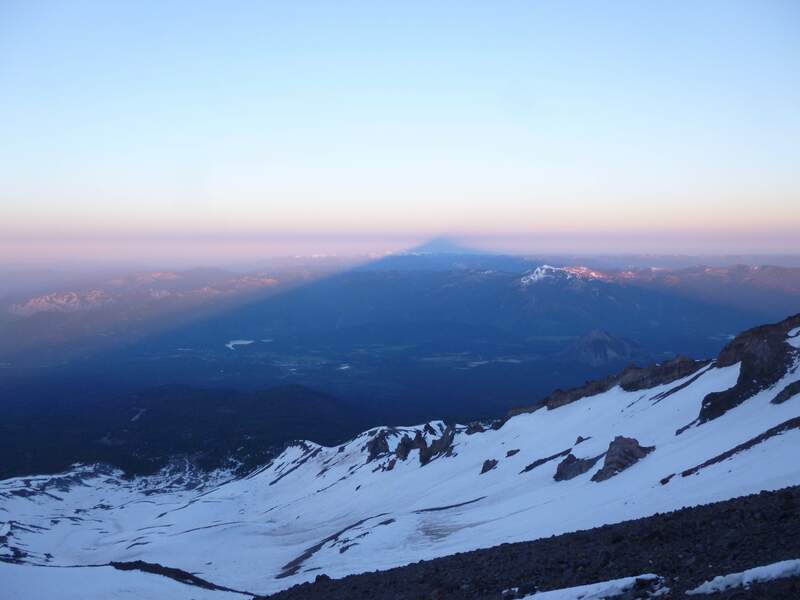 Mount Shasta cast a huge shadow below us. Above us, the Red Banks came into clear view. This wall of loose, red colored volcanic rock poses a climbing obstacle and is an objective hazard due to high rockfall potential. 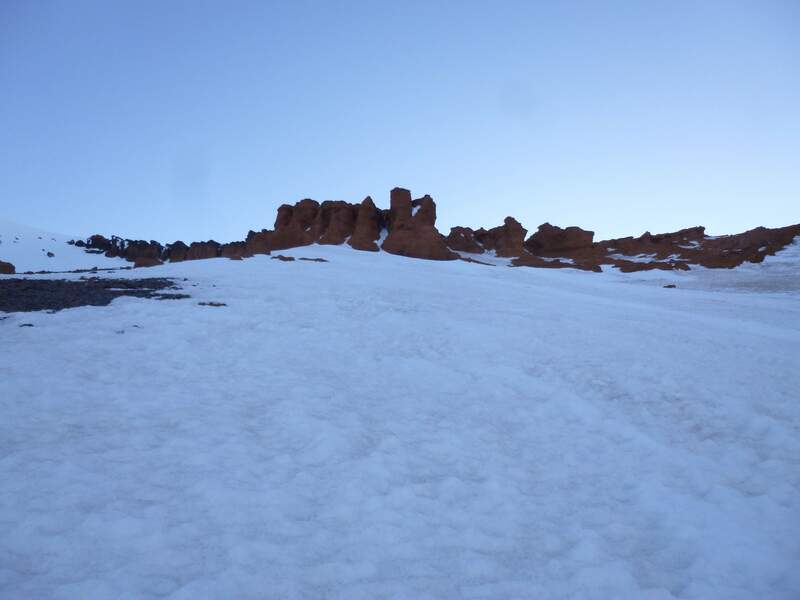 Without heavy snow coverage, the route gains the top of the Red Banks by ascending a notch through the rock. 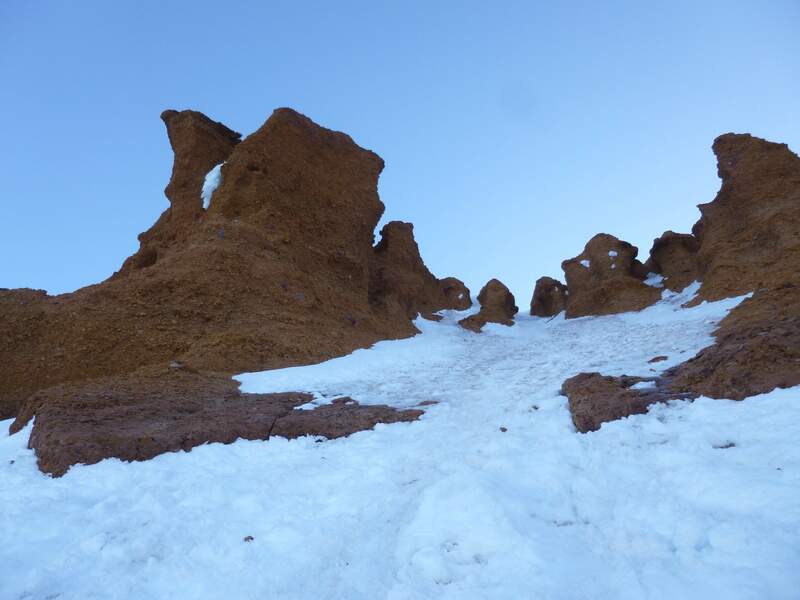 With more snow cover climbers can circumnavigate these rocks by climbing up between Thumb Rock and Red Banks. Due to recent warm weather this latter option was undesirable for us, due to the melted-out bergshrund which forms at the top of the Konwakiton Glacier on the north side of Thumb Rock. Approaching Red Banks we quickly found the correct notch to ascend. Viewed from below, we took the third notch from the right. 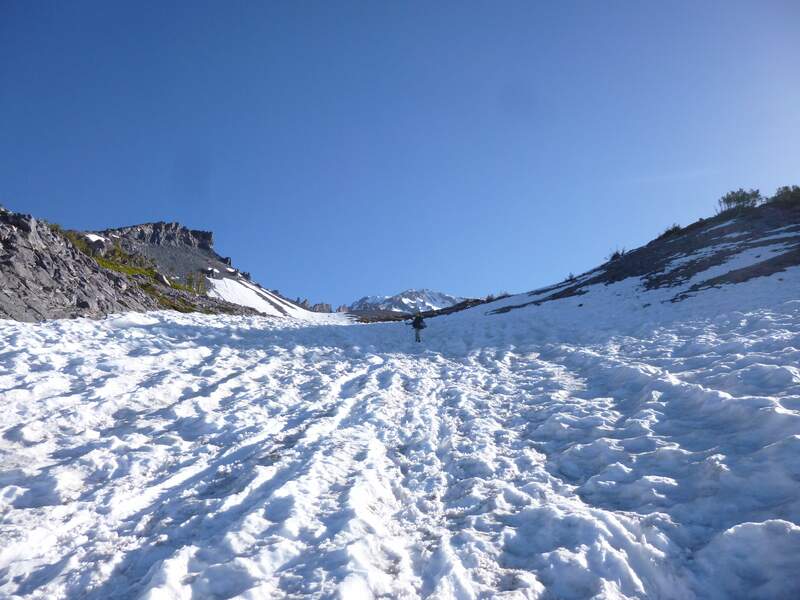 It offered a direct route through Red Banks via a narrow gully of snow. The notch in Red Banks. This was the steepest section of the climb. The rock here is very loose and crumbles away if touched, so we climbed carefully to avoid sending rocks down on those below us. 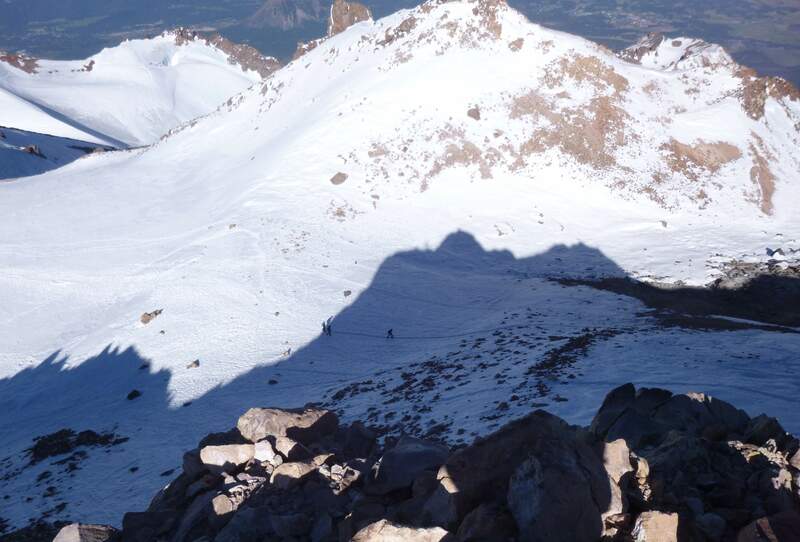 The day before, several climbers at Helen Lake had been complaining about heavy rockfall during their ascent, a result of the large crowd following the route. Looking down from the Red Banks. 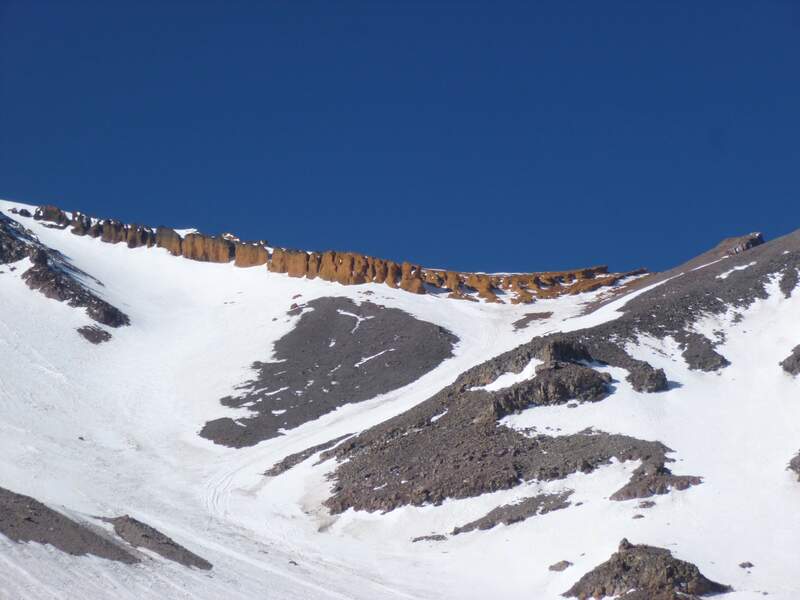 The narrow gully of snow leading through Red Banks. Once past the Red Banks, a gently angled slope continues upwards through more exposed volcanic rock. 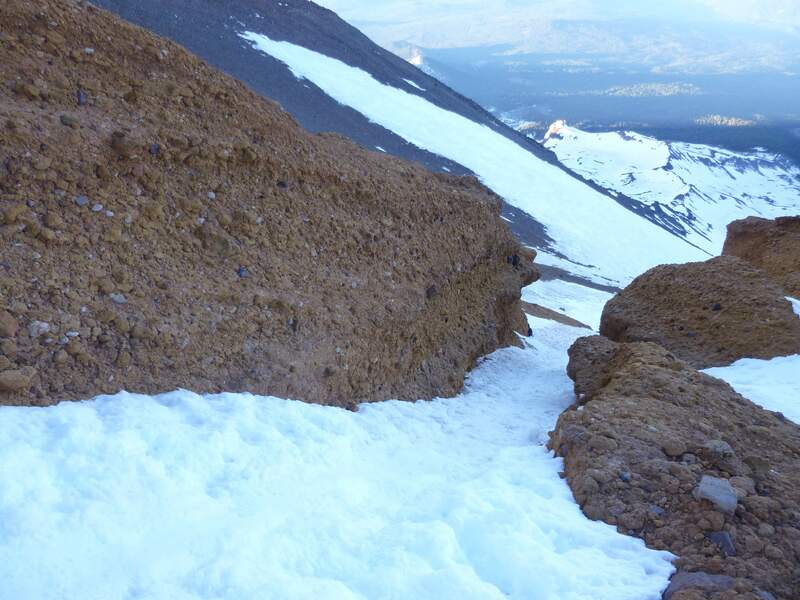 Ahead, Misery Hill posed the last terrain feature to be passed before the summit block. Misery Hill is a gentle slope and easy hike, but is so named because many climbers find themselves somewhat exhausted upon reaching it. Rather than follow the usage track directly over Misery Hill, we opted instead to go around the side. Here we discovered some lovely suncupped snow. Suncupped snow on Misery Hill. We had a good view of Thumb Rock and the Konwakiton Glacier. View from Misery Hill. Thumb Rock is below, to my left in the photo. The Konwakiton Glacier is directly below Thumb Rock. Once past Misery Hill the summit block came into view, with only gently sloped hills between us. 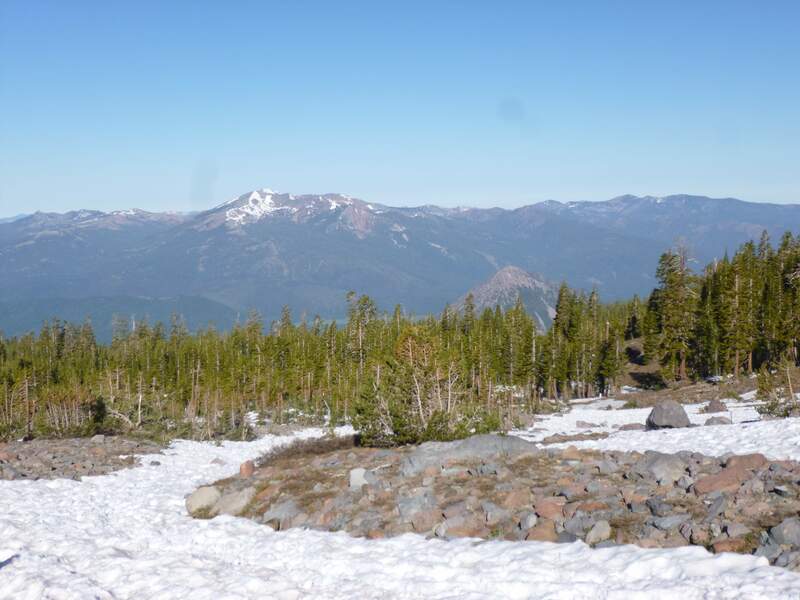 Shasta’s summit, center of the picture. The standard route circles around the summit block and ascends via a moderate slope from the west. 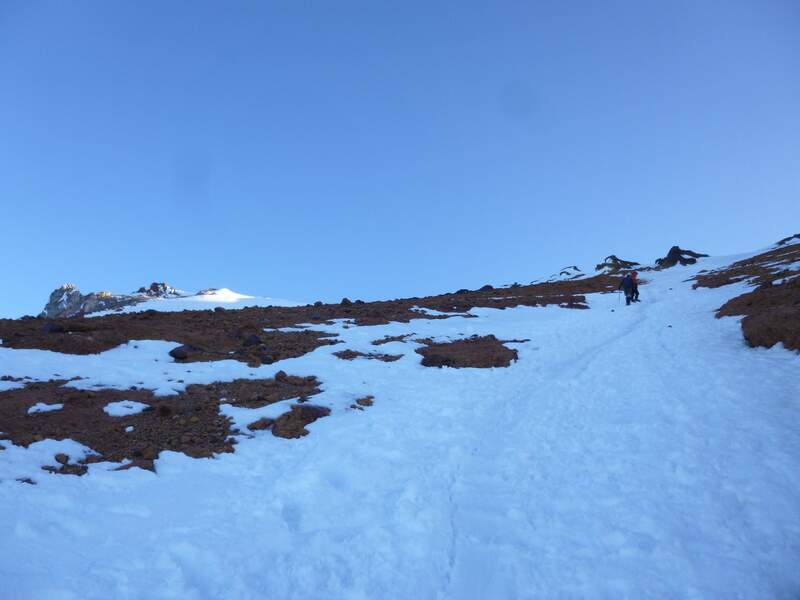 Approaching the base of the summit we discovered a more direct route through a gully of ice and snow. Looking towards the summit, the gully we took to the top in the middle of the picture. A short but very fun climb through the gully deposited us on top of the summit block, with the true summit just a few meters away. Heading up the gully, our final push to the top. The time was 8:30 a.m., the ascent taking us just shy of five hours. We appeared to be the first ones up the mountain for the day, and had the summit area all to ourselves. 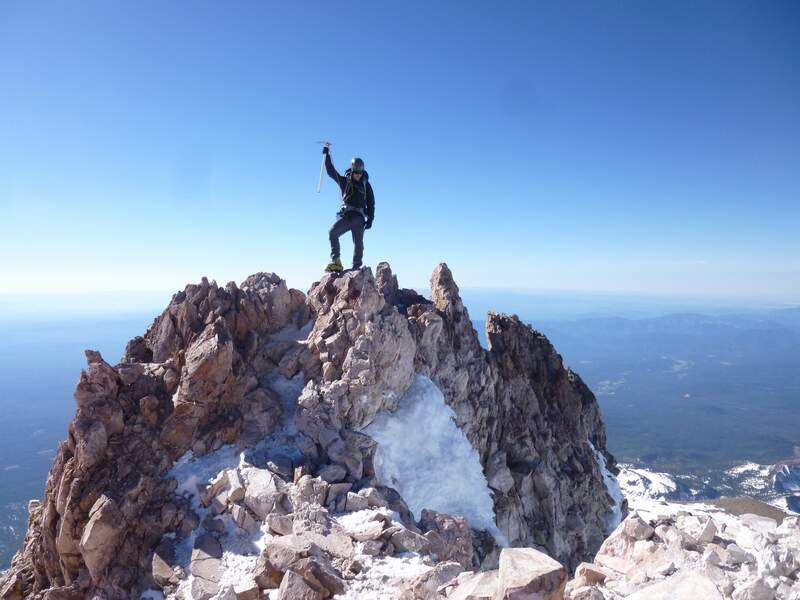 We all felt strong and very happy; it was incredibly rewarding to successfully reach the top. 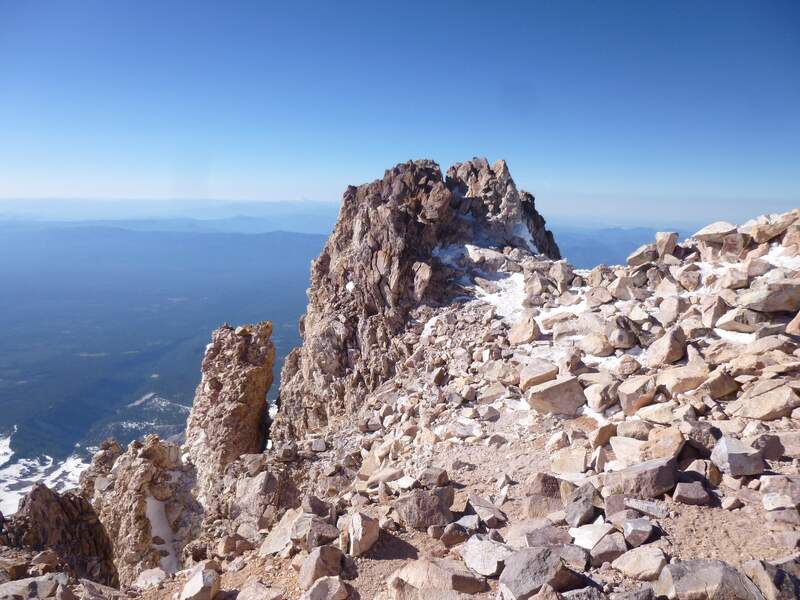 Shasta’s true summit, an exposed pillar of rock protruding from the summit block. 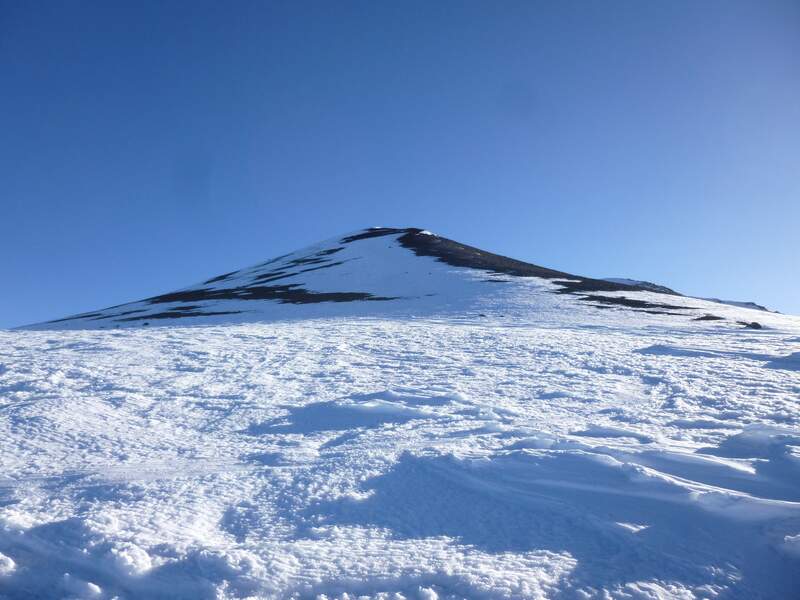 Another team approaching the summit, middle of the picture. 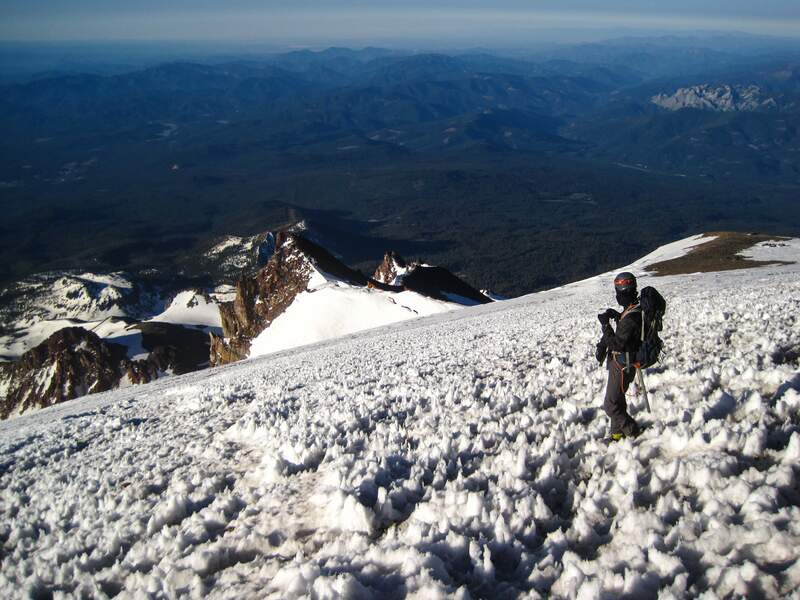 On the summit of Mount Shasta. We enjoyed a clear view underneath a cloudless blue sky. 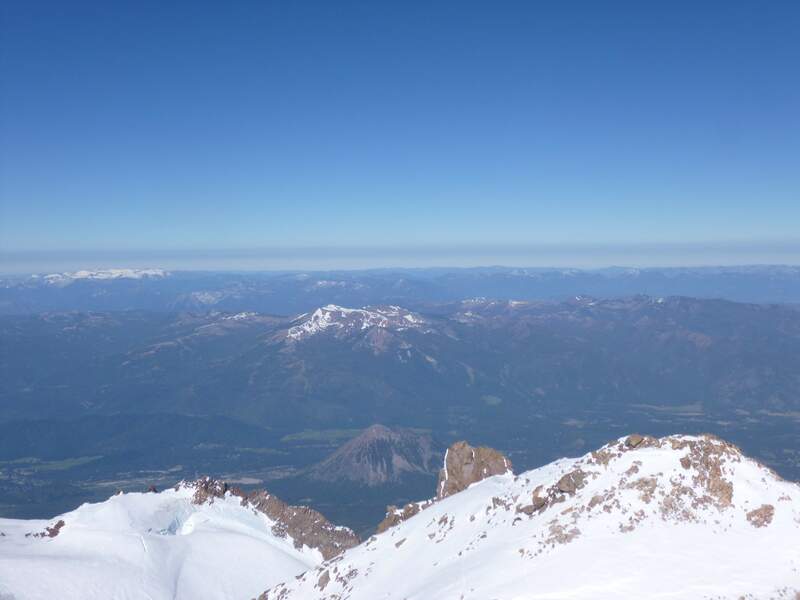 We spent a good ~45 minutes on the summit eating snacks, drinking water, taking photographs, and absorbing the views. With nothing much around Shasta approaching its elevation, we could see far over northern California. Taking a break on the summit, view north. More climbers began to arrive, and after signing the climbing register we decided to begin heading down. As we descended, an extraordinary thing happened. Somewhere around the top of Misery Hill, I managed to lose my camera. We were in good spirits and busy talking, and as I did not feel the need to take any pictures I didn’t notice that it was gone until we reached the top of Red Banks. It was still quite early in the day, and we had plenty of time to descend before the snow became uncomfortably soft, so I dropped my pack, grabbed some water and my ice ax, and headed back up to look for it. I retraced our steps up to where I last remembered using it, but to no avail – it was nowhere to be found. With my hopes of getting it back quickly sinking, I told every climber I encountered that I’d lost it, described the camera and gave them the location of my tent. My exhilaration and joy with the beautiful, thus far successful climb was overcast – we had a hike planned to begin in two days, and I was due to head to Washington state for an attempt of Mount Rainier the next week. Buying a new camera on short notice would be inconvenient and expensive – and worse, I’d lose all of my photographs. Back at Helen Lake, things turned around quickly. Someone came by my tent, and asked if anyone had lost a camera. 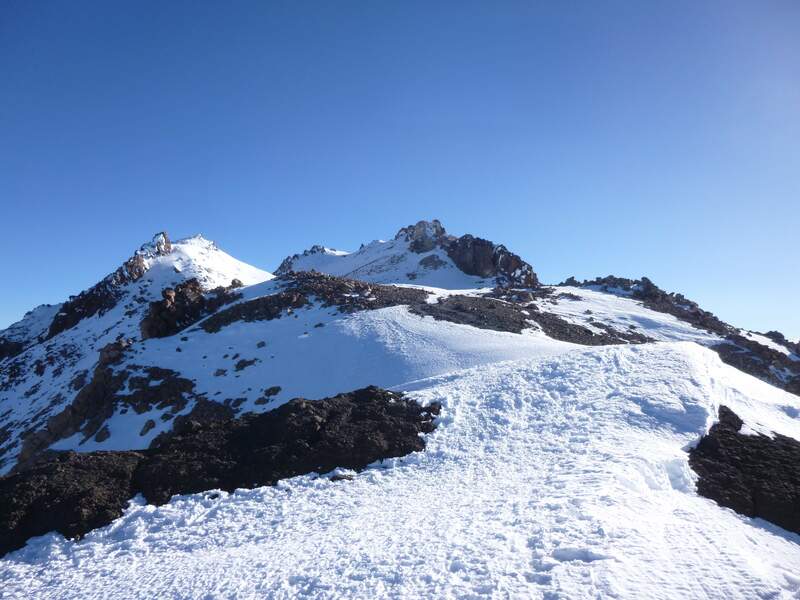 While this person’s team was descending the summit, behind my group, another group ascending had found a camera in the snow, and asked them if it was theirs. I realized that when I had retraced back up to the top of Misery Hill, the party who found the camera would have been near or on the summit. Sure enough, an hour and a half later this group returned to Helen Lake, and told me that the other climbers whom I had spoken with when retracing the route had already told them all about the guy who lost his camera. I was blown away, both by the friendly, helpful disposition of Californians, and the pragmatic communication of the other climbers, strangers who went out of their way to spread the word and help me out. In a great mood once more, we packed up our camp and headed down. 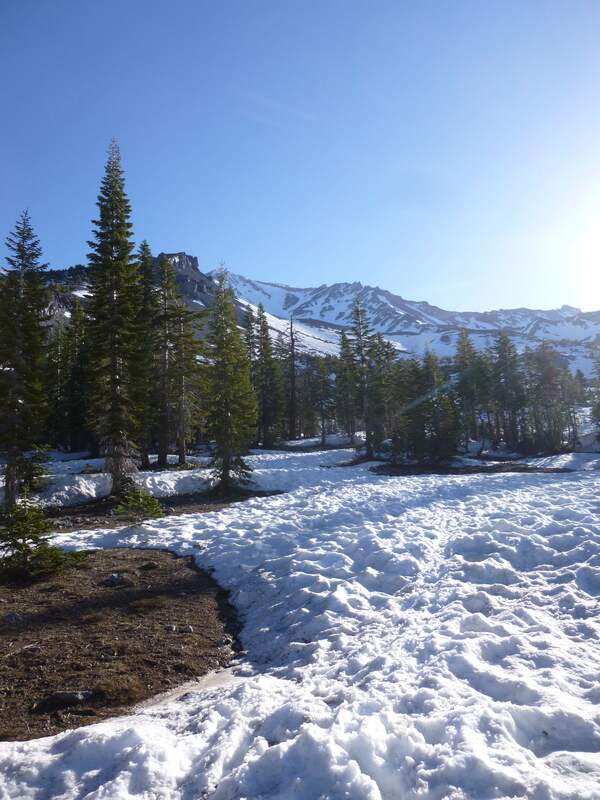 The section from Helen Lake to the treeline was a slog through deep, slushy snow heated up by the mid-day sun. As during the ascent of this section, the descent was remarkably hot. Returning to the treeline above Horse Camp. Finally we entered the forest, the shade providing relief from the glaring sun. At Horse Camp we stopped to use the washroom, hydrate, and take a 20 minute nap before continuing onward. 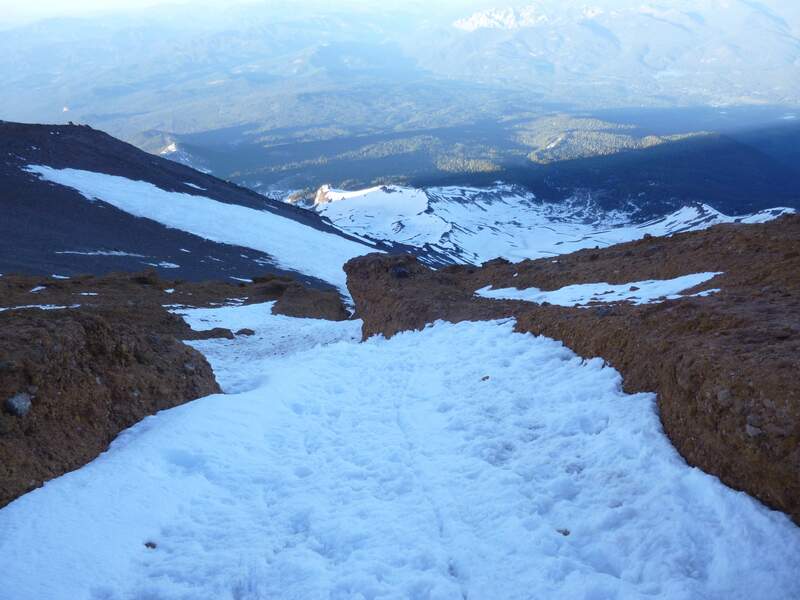 Descending onto dirt trail below the snow line. Below the snowline the forest was lovely in the sun. 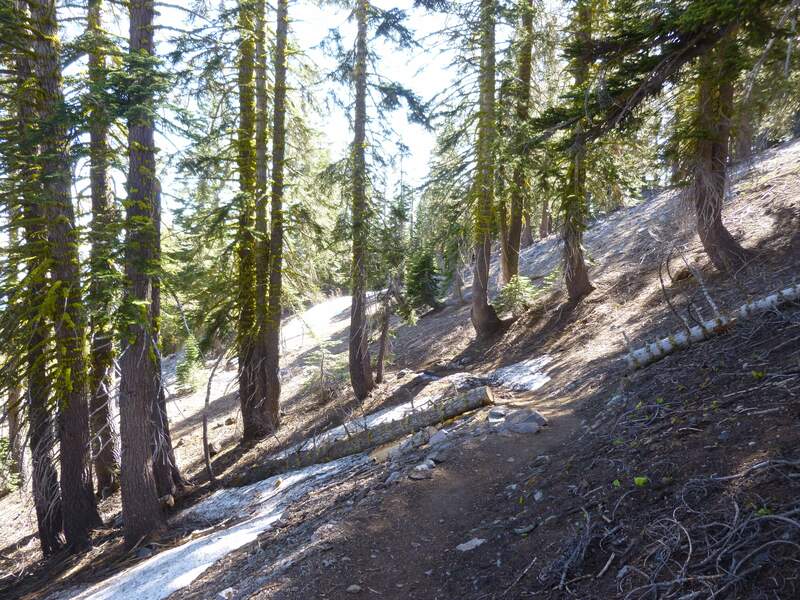 The forest above Bunny Flats. At Bunny Flats we changed into clean clothing, packed our gear into the car, and took off for the City of Lake Shasta. 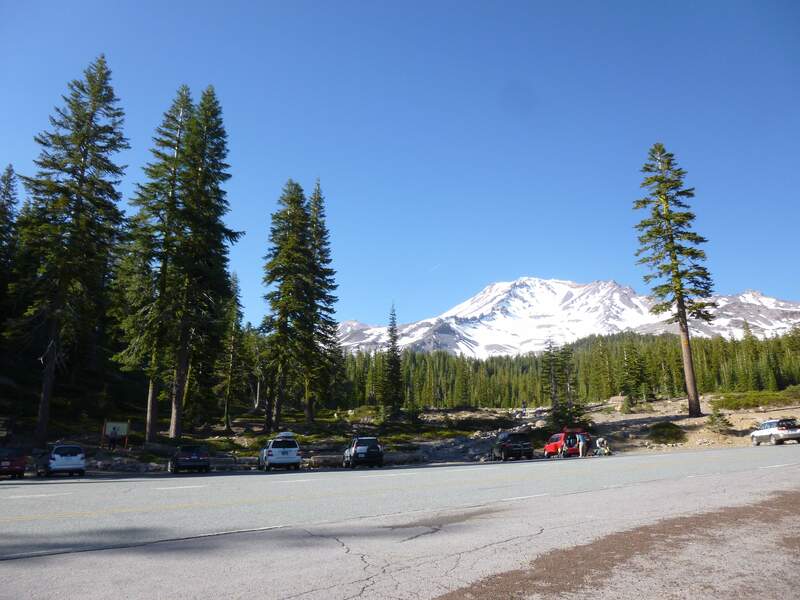 Looking back at Mount Shasta from the Bunny Flats trailhead. In Lake Shasta we stopped for an enormous meal of American diner food (huge portions, and very rich!) to celebrate our climb. 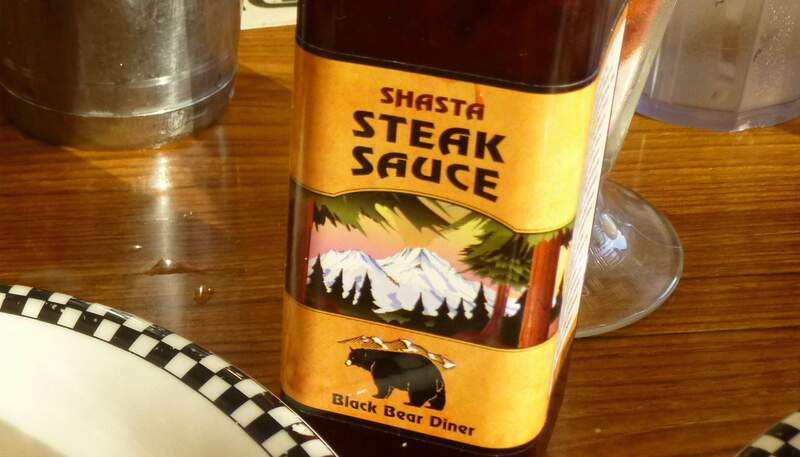 Shasta steak sauce complemented an enormous meal at a diner in the city of Shasta Lake. 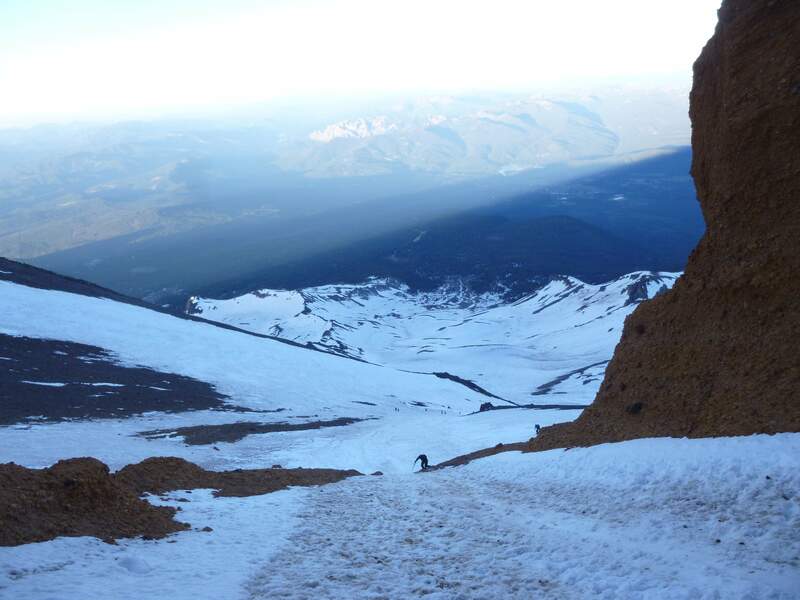 Climbing Mount Shasta was an excellent experience, and particularly rewarding. Planning and executing a trip like this is a large part of the enjoyment, and we felt quite accomplished on the summit when everything worked out as we’d intended. 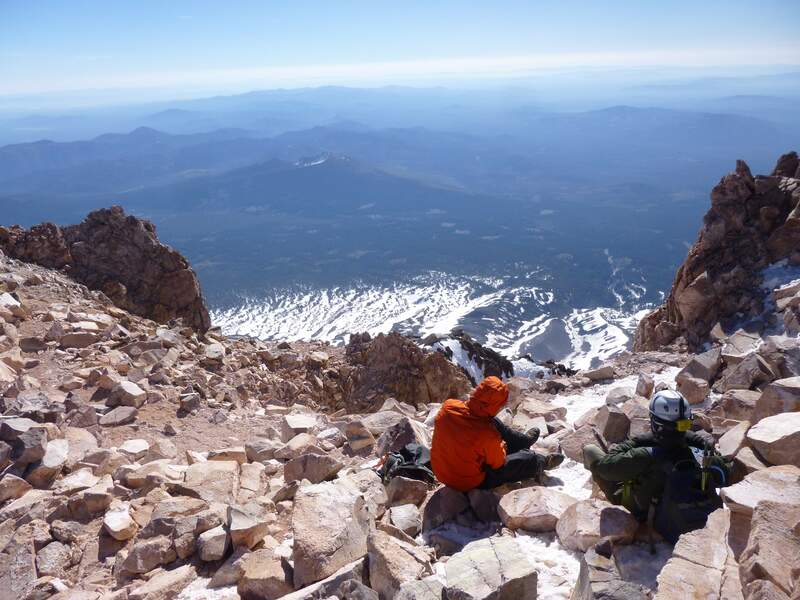 My friend who turned back was not disappointed – he had already climbed to the summit of Shasta twice, and had also made the decision to turn around on Shasta once before. Shasta is a beautiful mountain, and one I would definitely revisit if given the opportunity. I left the mountain feeling very pleased with the climb. 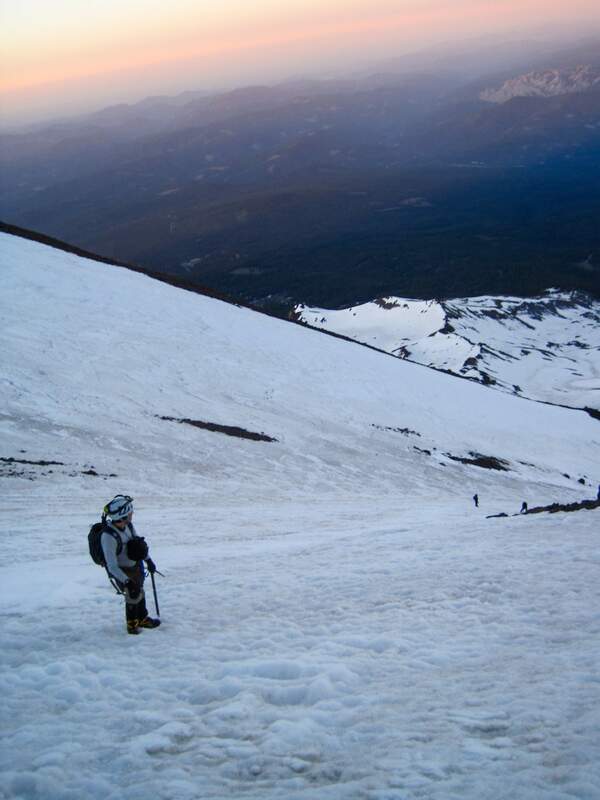 Mount Shasta is highly accessible, with parking lots at the popular trailheads, although access to the upper mountain is dependent upon seasonal weather. 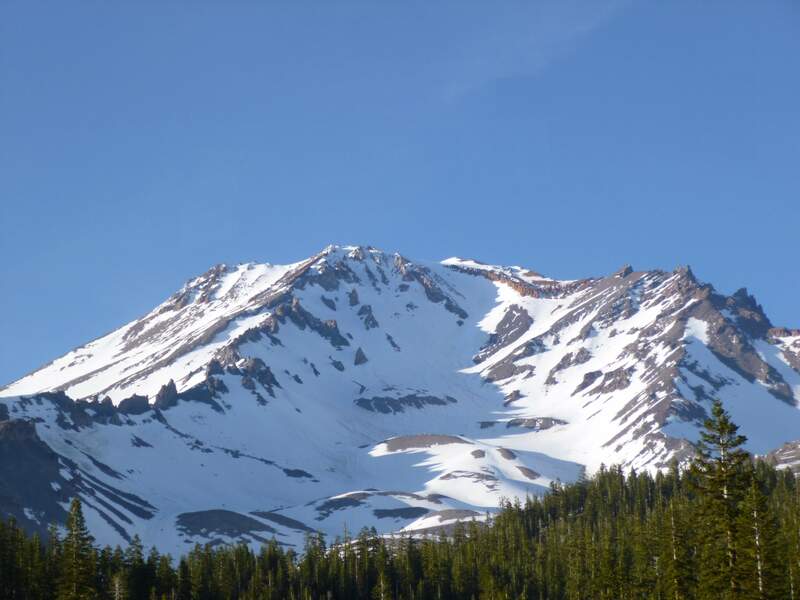 In the winter Mount Shasta frequently experiences fast changing, inclement weather, and heavy snowfall can create high avalanche risk. 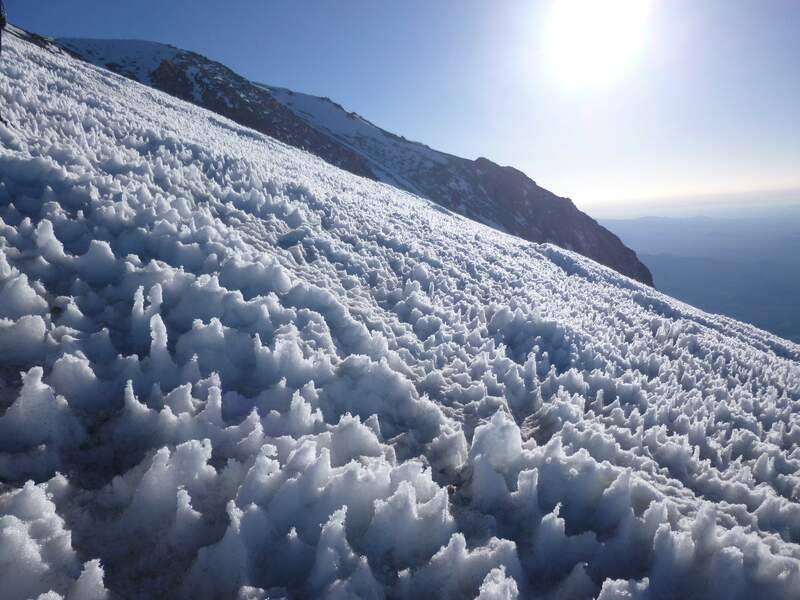 Despite this, Shasta remains a popular winter climb during weather windows. 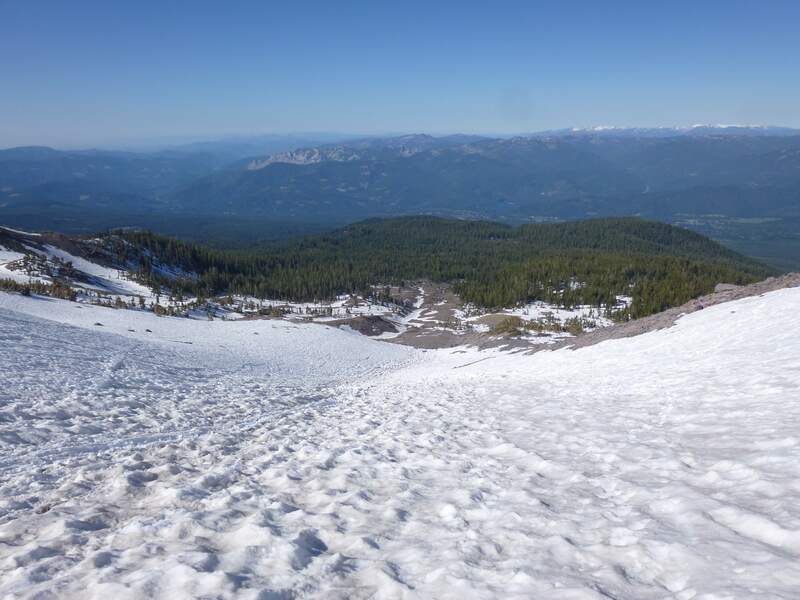 Route conditions begin to deteriorate by mid summer, as the snow will often melt out and create higher rockfall hazard around the middle of July through beginning of August. This varies year to year, and in 2013 the route was reported as being very dry by the beginning of July. 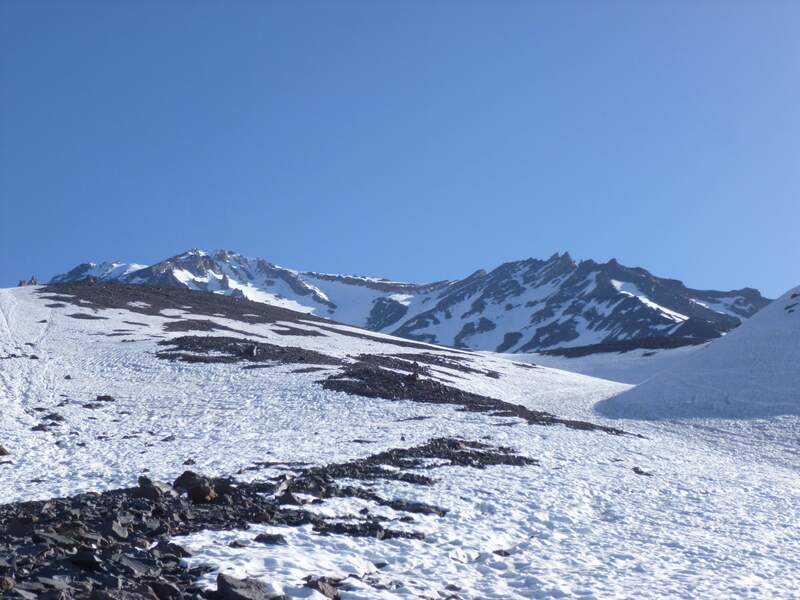 Shasta can experience high winds and stormy weather, making the upper mountain dangerous or inaccessible, at any time of year; monitoring of weather reports and good contingency planning is imperative to climbing safely. 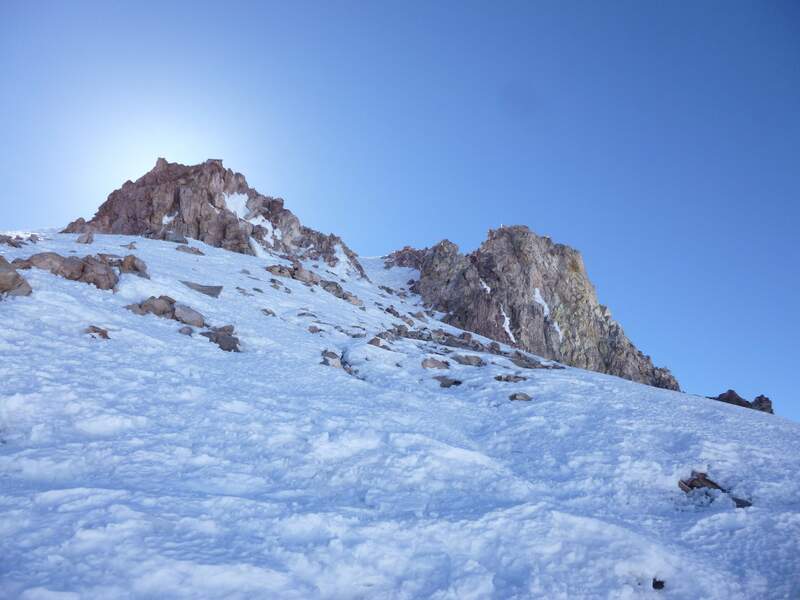 This entry was posted in Mountaineering, United States of America and tagged Avalanche Gulch, California, Cascades, Helen Lake, Horse Camp, Mount Shasta, Red Banks, Thumb Rock by Ian. Bookmark the permalink.